The Deformation-Uniform-Scale effect module is used to create the squash and stretch effect on your animated deformation rig. It will let you scale the rigged element on the opposite axis of the deformer (width). 1. In the Network view, navigate inside the Deformation Group to which you want to add a Deformation-Uniform-Scale module to. 2. In the Module Library, select an Deformation-Uniform-Scale module and drag it to the Network view. Note that the Deformation-Uniform-Scale module name changes to Deformation-Uniform-Scale as it enters the Network view. 3. Connect the Deformation-Uniform-Scale module directly below the lowest deformation module in your chain. 4. 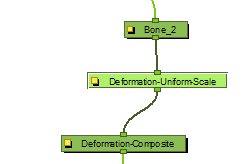 In the Network view, select the Deformation-Uniform-Scale module. 5. To display the Uniform Scale controls in the Camera view, or press [Shift] + [F11]. Refer to Displaying the Deformation Controls for more display options. 6. In the Camera view, grab the handle and drag it to resize the width of the limb. You can also use the Scale field to type in a specific value. This parameters can be animated over time. If you feel the controls are too far away from the deformer, you can change the default display of the Deformation-Scale and Deformation-Uniform-Scale controls in the Preferences panel to bring them closer. Refer to Deformation Preferences > Deformation to learn more.